This easy holiday side dish is kid tested and approved! These oven roasted carrots with brown sugar add a little sweetness to traditionally savory carrots, which is why they make a perfect holiday side dish. Everyone will love these brown sugar carrots! Roasted Carrots with Brown Sugar that make the whole family happy this holiday season! Last week I shared my creamy garlic mushrooms and my desire to find some new side dish recipes for us to enjoy! With now having family dinners together with Liam and him eating the same food as us, it’s become really important for us to make more balanced dinners – or really just more family dinners at home – which means we definitely need some new side dishes. 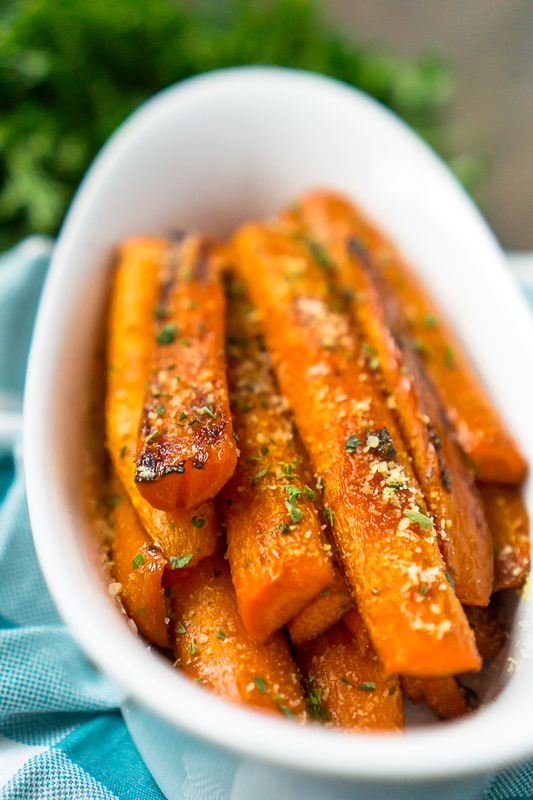 Enter these Oven Roasted Brown Sugar Carrots! We’ve been lucky so far in that Liam will eat most things, but it seems that he loves cooked carrots a little more than other side dishes, especially these roasted brown sugar carrots! He loves them! We love them! Your family and friends will love them! With their sweet and savory flavors paired perfectly together and both easy prep and cooking, these brown sugar carrots have also made it onto my holiday side dish rotation. While being very simple to make, they feel just special enough to make it as a Thanksgiving side dish or Christmas side dish. Because let’s be honest, you want your holiday menu to feel at least a little special and the brown sugar makes that happen for this carrot recipe. Now, raw carrots are not my thing; it’s the last veggie I will eat on a veggie platter. I mean, if I eat them, I want my raw carrot covered in a ranch veggie dip. However, I love oven roasted carrots. 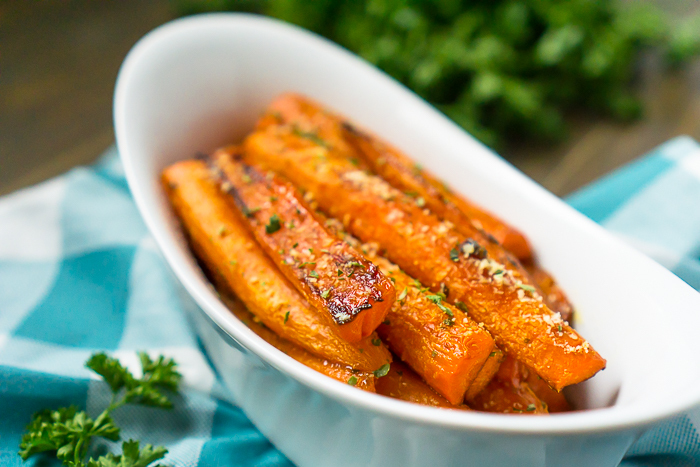 Roasting carrots brings out their natural sweetness and softens them without making them mushy. In fact, oven roasting vegetables is one of my new favorite ways to make veggies that seem to also make the rest of the family happy, too. I’m probably just really behind in this technique, but it wasn’t something my mother ever really did. Our favorite is probably my Garlic Parmesan Brussels Sprouts, and were excited to try these Roasted Balsamic Green Beans soon for dinner! Adding the brown sugar to the roasted carrots provides a rich, molasses flavor with the savory carrot. It’s a tasty combination that makes the perfect holiday side dish and easy enough for a weekday family dinner. I’m all for any recipe that only takes about 5 minutes of prep work with the oven doing the rest of the work! Making oven roasted carrots is a really simple process with only about 10 minutes of prep work and 20 minutes of cooking in the oven. The prep work can easily be done for this recipe ahead of time, even the day before, making it an even better option as a holiday side dish. OR you could cook ahead of time and then put back in the warmer to heat through for dinner. First, you will want to peel your carrots and cut them in half length-wise. If your carrots are particularly thick, you could always third or quarter them. Second, melt your butter and then add the brown sugar, minced garlic, thyme, salt and pepper. Mix well. Third, add mixture and carrots to a flat, shallow dish and roll the carrots through the mix, coating them thoroughly. Lastly, place your carrots in a single layer on baking sheet with sides without over crowding them. You want the heat to be able to get to the whole carrot. Then pour the remaining mixture over the carrots. Bake for 20 minutes or until the carrots are tender to the fork, turning them half way through. Enjoy! 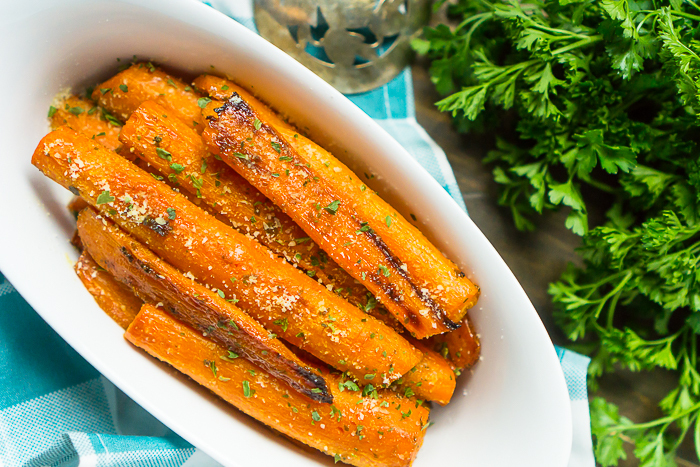 Roasted Carrots with Brown Sugar are Sweet and Savory! This easy holiday side dish is kid approved! Oven roasted carrots with brown sugar add a little sweetness to traditionally savory carrots. Everyone will love these brown sugar carrots! Preheat oven to 425 degrees F and line baking sheet with parchment paper. In a large, shallow dish, combine the melted butter, brown sugar, minced garlic, thyme, salt and pepper. Mix well. Add the carrots to the dish and roll the carrots through the mix thoroughly. Place the carrots in a single layer on the baking sheet, being careful to not over crowd the carrots. Then pour the remaining mixture over the carrots. Bake for 20 minutes or until the carrots are fork tender, turning them half way through.